Enter the airport name, city or IATA code in the box. OpenFlights will automatically suggest matches as you type, and if the airport is already shown on the map, OpenFlights will pop it up. Once you’ve entered a valid name, the Search button becomes active. If you click on this, OpenFlights will load a route map showing all flights from that airport. But there’s more! In the popup for every airport, there’s now a Routes button, which you can also use to see the map. If you click on the List button for the mapped airport (via popup or the top left corner), you’ll get a list of all flights operating from there; if you click on that button for another airport, you’ll get a list of all airlines connecting the two, even including codeshares. In these route listings, you’ll see little buttons, which will take you to flight booking site Kayak.com with a preloaded search for the airports and airline that you have selected. Buy your ticket from here, and OpenFlights get a little commission; just another little way to help support the site. So, with the good stuff out of the way, it’s time to confess to a few things that we can’t do, at least not yet. The route map covers routes, not schedules. 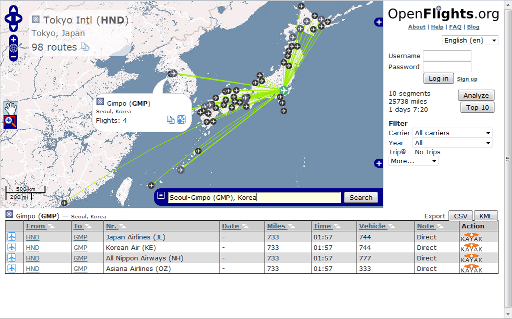 We don’t know exact flight days, times or route numbers; however, click through to Kayak, and it can usually tell you. The route map covers non-stop flights only. Singapore Airlines flies SIN-ICN-SFO, but if you click on SIN, you’ll only see the first leg. The route map does not support route finding. If there’s no direct connection, we can’t find it for you… yet. Route maps are offered per airport, not per airline (although this is on the to-do list). Filters, Analyze, Top 10 etc don’t work on route maps (yet?). If you try to use them, it will just show you the data for your flights. Last but by no means least, our thanks to our colleagues at Airline Route Mapper; without their amazing 53,000-route data file, this would never have been possible. The French (français) and Russian (по русски) translations of OpenFlights are now complete. Merci beaucoup to Mathieu Marquer for the first and спасибо большое to Alexey Aslanyants for the second! In addition, German and Polish translations are currently in the works. Can you help us with another language, or did you find something that doesn’t sound or look quite right in the current versions? Send me mail. Last but not least, we know there are still some parts of the interface that are not translated yet, notably the Help section and a few pulldown options. We’re working on these and hope to have them rolled out sometime next week as well. OpenFlights is getting a major workover to support full localization, so the site will be down for about an hour starting Monday June 8, 0:00 UTC for database migration and web server reconfiguration. Want to help us translate the site into other languages? Register your interest by mailing info at openflights dot org today. No programming ability needed, and we’ll be handing out free Elite levels to people who can help.